Happy freaking Monday everyone! It's my first day back at work after a super relaxing awesome 2 weeks off so it's a bit difficult to say the least! Anywho, welcome to my very first Empties post. To be honest, the title of this post is a little misleading. 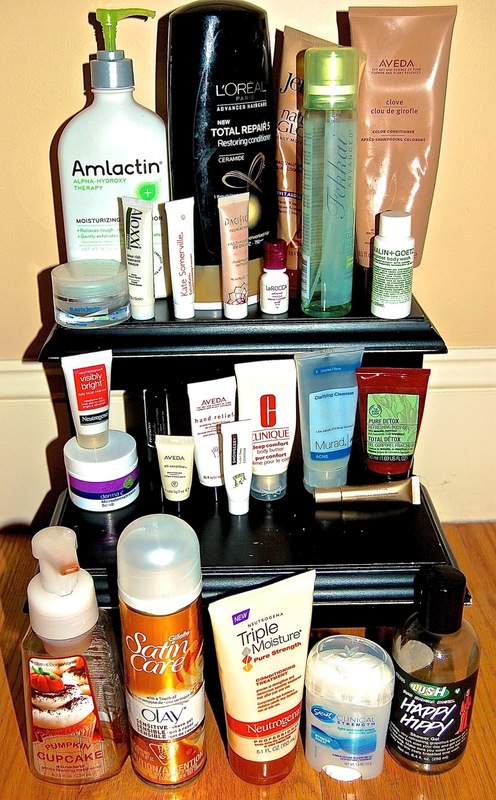 This is not all of my empties from 2013 seeing as how I only started blogging at the end of September. This is my empties since the beginning of my blogging journey. You will notice that a lot of these are sample sizes, I've had some of them for a very long time and felt I needed to use them up. In reality, it takes me a LONG time to get through an entire tube/bottle/tub of product so I'm not sure when my next empties post may be. It may seem silly to non-bloggers but this is one of my favorite types of posts to read. I love getting the opinion of others on what items they've truly tried and if they'd recommend it or not. L'Oreal Total Repair 5 Restoring Conditioner - This conditioner was moisturizing enough but I didn't notice anything special about it. I'd only re-purchase if there was a nice sale. Amlactin - This is an alpha-hydroxy moisturizer that I heard is good for super dry skin. It was nice on my arms but didn't really do much for my legs. I will not repurchase since this was expensive (I think ~$25) and BioOil which is cheaper works better for me. Gillette Satin Care Shave Gel - This is actually not an empty. The dispenser spout stopped working which is annoying. This is my fave shave gel and I've been faithful to it for years. I will definitely repurchase. Jergens Natural Glow Gradual Self Tanner - This is not an empty, I am tossing it because I can't take the stench anymore. It smells like feet and onions or some other sort of disgusting combination! Aveda Clove Color Conditioner - This actually deposits a little bit of brown color to my hair which I love. However, it's not the least bit moisturizing and I don't like the smell (I don't like the scents of any Aveda products). It's possible that I'd re-purchase this just because of the color deposit qualities of it. Bath & Body Works Anti-Bacterial Foam Hand Soap - I probably won't list this as an empty again because I go through them so quick. These are my fave hand soaps though. I always have several of these in stock. Fekkai Glossing Mist - I love this and have already gone through a few bottles. The scent is not very pleasant but I love the shine it gives and that it's a spray. I prefer hair products that I don't have to touch. I know, that is very very strange. Definitely a re-purchase. Lush Happy Hippy Shower Gel - This is a decent shower gel but I didn't like the smell. Won't re-purchase. Neutrogena Triple Moisture Conditioner - This is an excellent moisturizing conditioner. I've already re-purchased this. Elastiderm Obagi Eye Treatment - This is a nice light eye cream. This is my second tub and I really like it. I didn't notice any improvement on my under eye lines but I also didn't notice them getting worse. I have a few other eye creams to use so I won't re-purchase this for a while but I probably will eventually. Pacifica Alight Multi-Mineral BB Cream - This was not good on me. The coverage was next to nothing and it felt greasy on my face. I would never purchase this. Murad Clarifying Cleanser - This feels nice and makes my face feel really clean. It doesn't leave a film behind. I have several other cleansers to get through but I would definitely re-purchase this. Malin+Goetz Bergamot Body Wash - This was a fine body wash. To be honest, besides scent I think body washes are a dime a dozen. Clinique Deep Comfort Body Butter - This is very thick moisturizing body cream. It was so heavy though that is was hard to really rub it into my skin. I would not re-purchase. Derma e Microdermabrasion Scrub - I LOVE this. My face was so clean and bright after I used it. I will re-purchase. LaRocca Hibiscus Cream Cleanser - This left a film behind after cleansing. I wouldn't re-purchase. Aloxxi Colour Rich Treatment Masque - This was a nice moisturizing hair masque. I wouldn't re-purchase though because there are tons of other masques out there that I haven't tried yet. Exfolikate - This is a great exfoliater. If it wasn't so expensive I'd definitely re-purchase. Aveda All-Sensitive Moisturizer - This was a decent moisturizer but nothing special. Wouldn't re-purchase. Aveda Hand Relief - This was a very nice hand cream but as I've stated, I don't like the scents of Aveda products so I wouldn't re-purchase. p.s. You may wonder that since I don't like the smell of Aveda products why I have so many products. Well turns out that my best salon experiences end up being at Aveda salons and my current salon is an Aveda salon. Go figure haha! Lancome Hypnose Doll Lashes Mascara - This is a great mascara. It lengthened and seperated my lashes. I would re-purchase. Jane Iredale Longest Lash Mascara - This made my lashes slightly darker, that's about it. I wouldn't re-purchase. Snowberry Instant Deep Cleanser - This was a great cleanser and made me feel very clean and fresh after. I would re-purchase but it's a bit pricey. The Body Shop Pure Detox Refreshing Body Gel - Another decent body wash that I didn't like the smell of. Wouldn't re-purchase. Neutrogena Visibly Bright Daily Facial Cleanser - I didn't like this because it left a slimy film behind after rinsing. Wouldn't re-purchase. Please let me know if you have any questions or would like to know more details about any of the products I listed. Yes my dear, I had this trash in my bathroom cabinet for a few months! But most of these were small sample sizes so they all fit in a small bag. The bigger things like the conditioner, etc. was annoying to have to look at till I wrote this. To be honest, it felt awesome throwing them all away last night after I finished writing this up lol! Thanks for visiting! I did just buy some shampoo and condition from the L'Oreal line, different flavor though. It was only $1 each. So we shall see. Amlactin smells funny too. LOL!! I couldn't help but wonder what you were doing sniffing feet and onions at the same time!!!! LOL!!! I love the Fekkai glossing mist... if you can't find it try the Organix Renewing Moroccan Argan Oil Weightless Healing Dry Oil. It's a solid second place. I find that I do empties about once a quarter. So I do them 'seasonally' You know I loved your trash. Thanks for sharing with us!!! $1, how?!?! LOL about sniffing feet and onions hahaha! It really just reeks! yuck! Thanks for the tip about the Organix oil, I'll put it on my shopping list! Thanks for visiting! love the amlactin, as well as other products you've shown. i need to get on my empties stat and film them! Yes, I love watching/read about people's "trash" LOL! Oh wow! What a list of empties! It takes me forever to finish something, I've been trying to keep my trash, but I sometimes forget lol!! I tried that L'Oreal shampoo and conditioner when it first came out, and like you, I didn't notice anything special about it. It does smell really good though! LOL!! OMG, there were some products that I forgot to keep the empties so this list is actually a bit longer haha! Thanks for visiting! LOL, thanks for the award! I may do future empties posts a little more often so I don't have to do a huge list like this one haha! Thanks for stopping by!